In this episode, Jay concludes his discussion with spiritual warfare specialist Apostle DoQuoi Green by addressing the question: Why must we fight for our marital destiny? 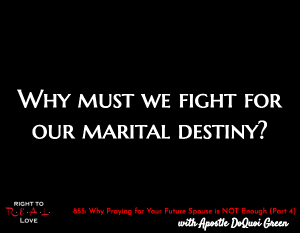 Why must we fight for our marital destiny? Tactics the enemy will use to keep your future spouse away from you. Why we should never give up on praying and warring for our future spouse. The value in fighting for your marital destiny. Apostle Green provides an example of how to engage in spiritual warfare. Apostle Green shares his experience of waiting, praying and warring before he met his wife.